ChengXiao, Jung Minjoo, Choi Yuna, Kim Jiho, Lee Seokmin. There are 5 active idols debuted from this class.. The more shocking thing is that they don't major in practical music, but practical dance..
And there are 2 main vocals debuted from this class.. 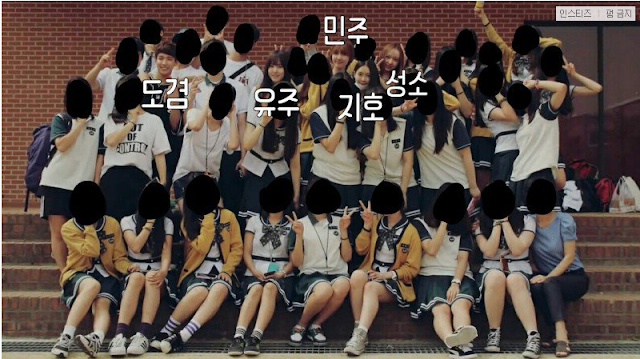 This is what you call flower garden..
-I guess Cheng Xiao entered the school early than the other kids in her age.. -Hul?? I thought Cheng Xiao was the name of the group until the moment I read this.. So Cheng Xiao was the member's name.. Why didn't I know this..
-Huk.. But does that mean that girl's last name is Sung and her first name is So? (Cheng Xiao is written as Sungso in Korean)..? -There's no way that Lee Seokmin is not mine..
-That's right.. This class was unbelievable.. The fact that NCT's Jaehyun and DIA's Jung Chaeyeon were in the same class is unbelievable as well..
-Seokmin is a man who majored in dance..
-Oh.. Our Jungkookie was in the class next to theirs..
-Hul Jiho was from the same school!! -I heard Jaehyun? also went to the same school? -I also heard that Kang Mina and Mark are in the same class right now..
-Our Seokmin is too handsome!!! I might die!!! -Who's the other main vocal beside Yuju? -I don't know anyone else beside Yuju and Dokyeom..